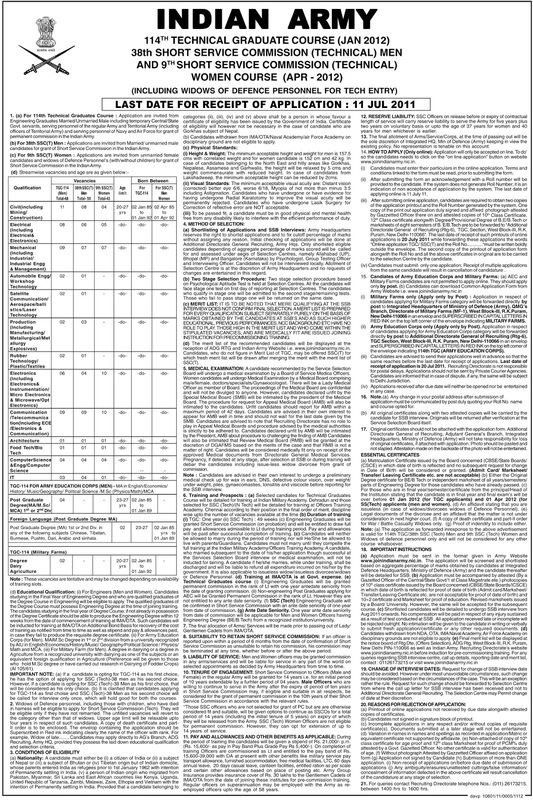 Application Instructions: Candidates may Apply Online at Army Recruitment website http://joinindianarmy.nic.in from 13/06/2011 to 11/07/2011 only. After submitting your details, take two printouts of the system generated registration form, send one system generated Application Forms along with relevant certificates, signed, paste a recent passport size photograph and send it to the following address in order to reach by 20/07/2011 by registered post/ speed post to Additional Directorate General of Recruitment (Rtg-6), TGC Section, West Block-III, R.K. Puram, New Delhi - 110066. For Military Farms only : Duly filled Applications in respect of candidates applying for Military Forms category will be forwarded directly to Directorate of Military Farms (MF-1), QMG's Branch, West Block-III, RK Puram, New Delhi-110066. More detail regarding this entry scheme and online submission can be seen at http://www.joinindianarmy.nic.in. and You may also click on the image to see/download the image to view detailed advertisement.